Recently Google added advanced voice search to the Chrome browser. Google's advance voice search feature was previously only available for Android and iOS, but is now available on Mac and Windows. The feature is similar to Apple's Siri ,but works on your computer as well as mobile devices. To access the feature, navigate to Google using the Chrome browser and press the microphone icon to the right of the search bar. Then you can search by voice and Google will speak back select results. I have found the voice recognition to be very fast and accurate. One of the most notable features for struggling spellers is that you can ask how to spell a word and then Google will speak back the correct spelling. Google will also provide spoken responses for many other queries as well. Watch the above video to learn more. This year iOS accessibility did not get the prime-time attention that it did during last year's WWDC Keynote, but iOS 7 still includes many new accessibility features. When iOS 7 launches in the fall, users of all abilities will find beneficial features. iOS 7 is still in beta so Apple can always add or remove features before the final release to the public. Through the Apple Keynote and other sources a number of accessibility features have been detailed. These new features will improve on current accessibility features such as VoiceOver, Guided Access, Speech Selection, Assistive Touch, and Zoom. This post will be updated as new information becomes available on iOS 7 accessibility. Click read more to learn about iOS 7 accessibility. 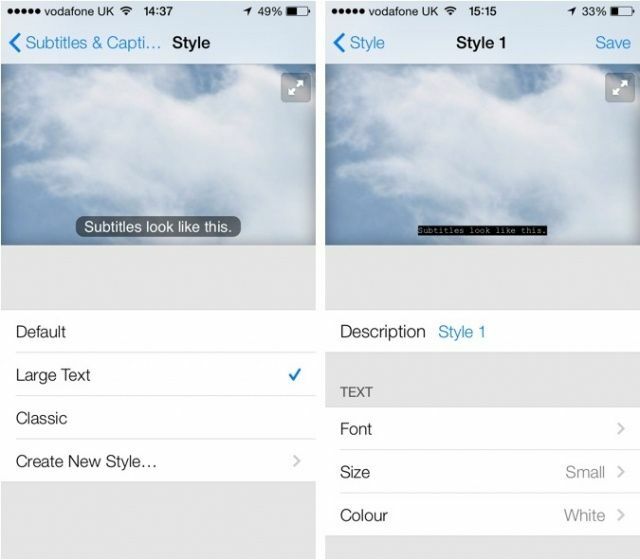 iOS 7 will also allow users customization the font and size of subtitles. Currently the subtitles are small and can be hard to read particularly on the iPhone and iPod touch. In iOS 7 the font, size, and color of subtitles can be changed. One of the coolest features for the blind and visually impaired in iOS 7 is the ability to redeem iTunes gift cards using the devices camera. 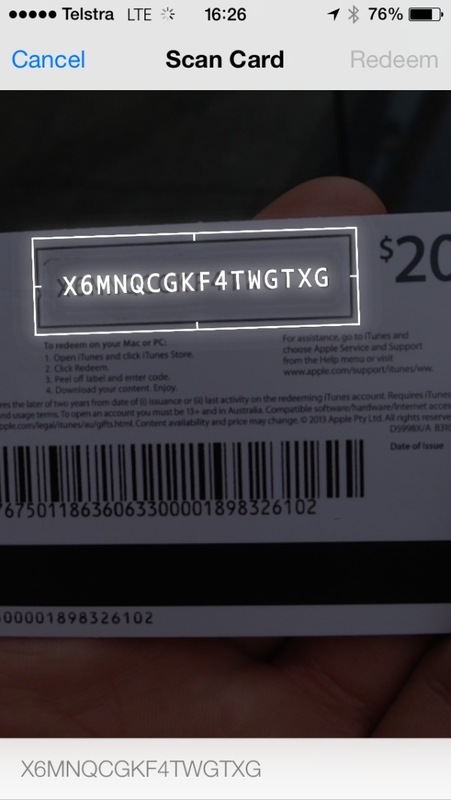 This will allow users who cannot read the small codes printed on the back of iTunes gift cards to redeem their gift cards easily without assistance. This feature originally debut on iTunes 11 on the Mac. Along with updated Siri functionality Apple has added multiple high quality text-to-speech voices. The voices are both male and female and sound much better than the previous Siri voice. It is not clear is these new voices will be available for VoiceOver and Speak Selection or exclusive to Siri. According to AppAdvice iOS 7 beta 2 also includes Switch Control. 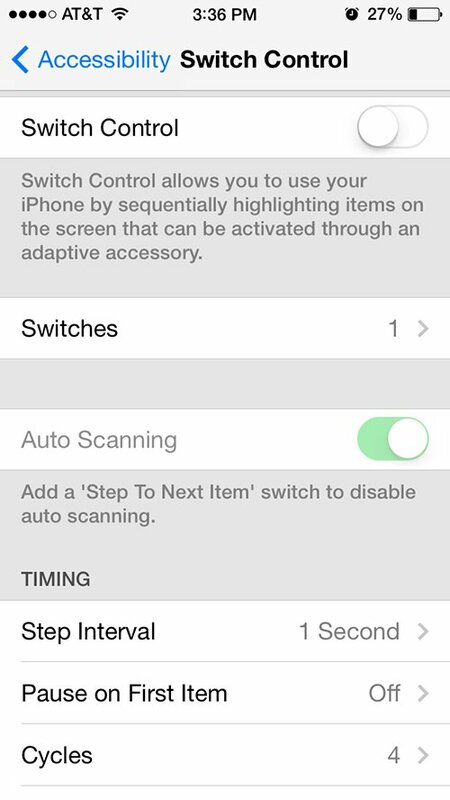 Little is known about the feature but the name suggests that iOS 7 will allow a user to control their device through switches. These switches are designed for people with physical disabilities who may only be able to activate one or two large switches. A separate post on MacRumors say that iOS 7 will allow users to control their device with head movements. From the screenshot it appears that head movement could be part of Switch Control and be used to activate a switch but it is unclear at this time. Below is a video of Switch Control. Last year in iOS 6 Apple included Guided Access which could put the device in a single app mode. Guided Access was targeted for users with autism. This year iOS 7 will add a Guided Access API for developers. This feature will allow developers to build apps that integrate deeply with Guided Access to give users more control of Guided Access. iOS 7 is also reported to include new APIs to allow developers to detect blinking and smiling which could help disabled users control their device. It has also been reported on 9to5mac that Apple will include a text-to-speech API which would allow developers to easily integrate text-to-speech into their app. iOS 7 is looking like a great release for all iOS users including users with disabilities. Apple is likely to change feature until iOS 7 is released to the public in the fall. Apple's World Wide Developer Conference (WWDC) starts Monday June 10th. At the event Apple will detail "the future of iOS and OS X." Apple is a leader in integrated accessibility with their VoiceOver screen reader and numerous other accessibility features such as Guided Access, Speak Selection, Zoom, and Assistive Touch. That being said Apple still needs to improve their accessibility features to remain a leader. New accessibility features have routinely been added to new versions of iOS. Last year, Apple added Guided Access along with other accessibility improvements. A new version of iOS is exciting not only because of the cool mainstream features but the lesser known, but no less important accessibility features that make the devices usable for so many. Make sure to visit The Assistive Technology Blog after the Keynote for all the iOS 7 and OS X accessibility news. In the meantime check out my iOS 7 Wish List video below.